For small to medium, local businesses, going to Google and typing in their products and services can be discouraging. Major national companies like Amazon and Trulia often dominate search results, making smaller businesses feel like it’s impossible to compete. But there is one thing they have over the big boys – their location. Google now places a huge emphasis on showing search results for location-based searches and utilizes the location information on each organization’s website and across various other websites such as online directories to serve those search results. That’s where having your “N.A.P.” information updated and consistent on both your website and across other platforms is important for gaining the local SEO value of N.A.P. listings for your business. There isn’t anything fancy about it, but it can have a huge impact on your local SEO rankings. Your N.A.P. information is comprised of your organization’s name, address and phone number. This information is typically listed somewhere on your website (i.e. your contact page) and on other sites such as Yelp or Merchant Circle. With Google’s more recent emphasis on serving more localized results to searchers, having your N.A.P. information up-to-date and consistent across multiple platforms is key to harnessing its power for local SEO. Each of these N.A.P. listings, whether on your site or another external site, is called a “citation”. Google and other search engines look at these citations to ensure that it’s your legitimate business location and, ultimately, building trust around your business. The more listings you have with the exact same information (i.e. no variations like “St.” versus “Street”), the more trustworthy you’ll appear to Google. Then when someone is performing a geo-targeted search, Google utilizes this information to produce the most relevant, localized results. First of all, you’ll want to make sure that Google can “read” your N.A.P. information (a.k.a. it’s crawlable). This means you’ll want to make sure that this information is actual text, not an image with text on it because Google cannot “read” or see images like we do as users. The placement and look of your N.A.P. information doesn’t have to be fancy. A simple blurb of your name, address and location somewhere on your website (I’d recommend your contact page and/or footer) is sufficient. You can also place this information in your code if you’re using a platform like WordPress, for example, in your footer.php file. Whether your business is just starting out or it has already been around for decades, it’s important to utilize the tools and information that Google gives you in order to compete on a local level. Yes, word-of-mouth plays a huge role in marketing locally, but let’s face it, more people are going online than ever to find their next “spot”. N.A.P. listings are just one, simple yet effective tool that you can use to skim ahead of your local competitors. 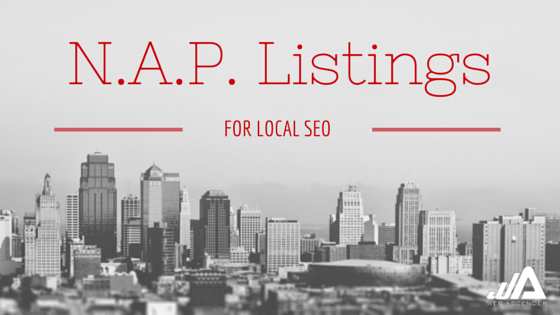 Want some other tips on how you can amp up your local SEO? Shoot me a message! All of the tools you'll need to run successful inbound marketing campaigns.